I am a research staff member at IBM TJ Watson Research Center at Yorktown Heights, NY. I recently received my PhD from the Human-Computer Interaction Institute (HCII) at Carnegie Mellon University. My research explores novel tools that assist users in various aspects of the software development process, such as debugging, testing, and creating tutorials and documentations. My PhD research centered on enabling end-user programmers to create web applications and use web data services. Now, as an industry researcher at IBM, I focus on designing new tools that help professional programmers create cloud applications. I am originally from Taipei, Taiwan. I got my B.S. in computer science from National Taiwan University in 2009. This website serves mainly as an archive for my research projects. 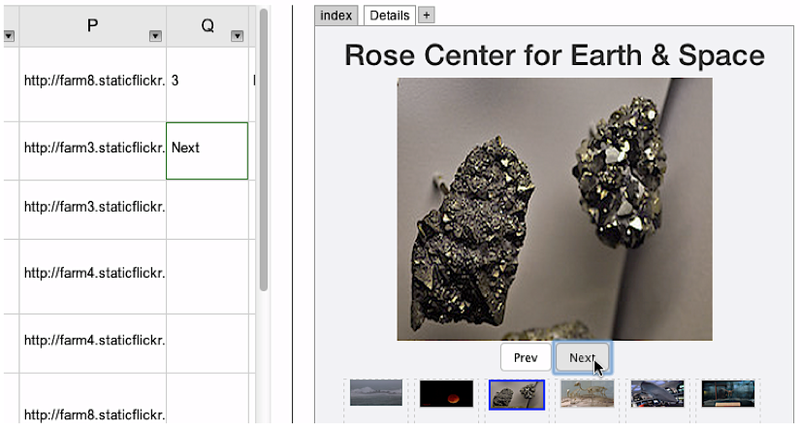 Gneiss is a spreadsheet tool that help people use hirarchical data and streaming data from web services and create interactive, data-driven web applications. 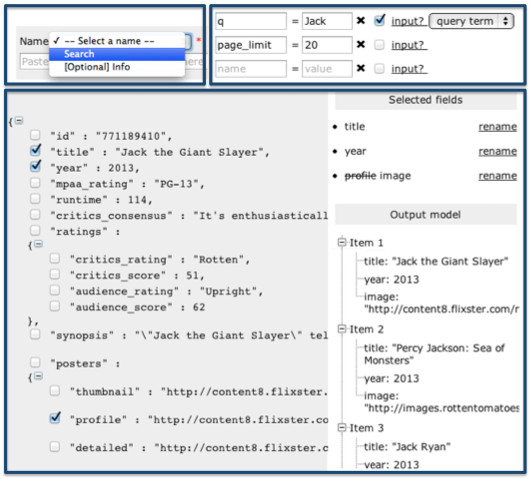 Gneiss introduces a spreadsheet model with novel spreadsheet langauges and interaction techniques to support exchanging data with web services (VL/HCC'14), using hirarchical JSON data (CHI'16), using streaming data (CHI'15), programming interactive web applications that use backend data (UIST'14). See more details in our project page. While I was at IBM, I built Lunch Line, a system that combines a large display and a mobile web application to publicly and privately encourage healthy eating. 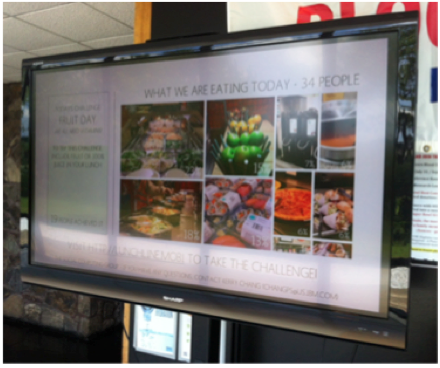 The large display shows a social visualization of the community's lunch intakes, and a daily "food challenge" that encourages certain healthy food. The mobile application lets users report their lunch and compare with USDA recommendations and other users. We deployed Lunch Line for 3 weeks in a company's cafateria. We found Lunch Line effective in nudging people's food chioces, and we shared lessons on how to improve this technology for long-term use. See our paper at UbiComp'14. While there are thousands of data sources that provide web service APIs giving access to their databases, creating mobile applications to use those sources requires significant mobile programming knowledge and a lot of of time. We introduce Spinel, a plug-in architecture for Android, and a set of web-based configuration tools that together enable end users to connect mobile applications to new data sources without programming. See our paper at VL/HCC'13. WebCrystal is a web development tool that helps users understand how a web page is constructed. It allows the user to quickly access HTML and CSS information by selecting questions regarding how a selected element is designed, and provides answers using a textual description and a customized code snippet that can be copied-and-pasted to recreate the desired properties. 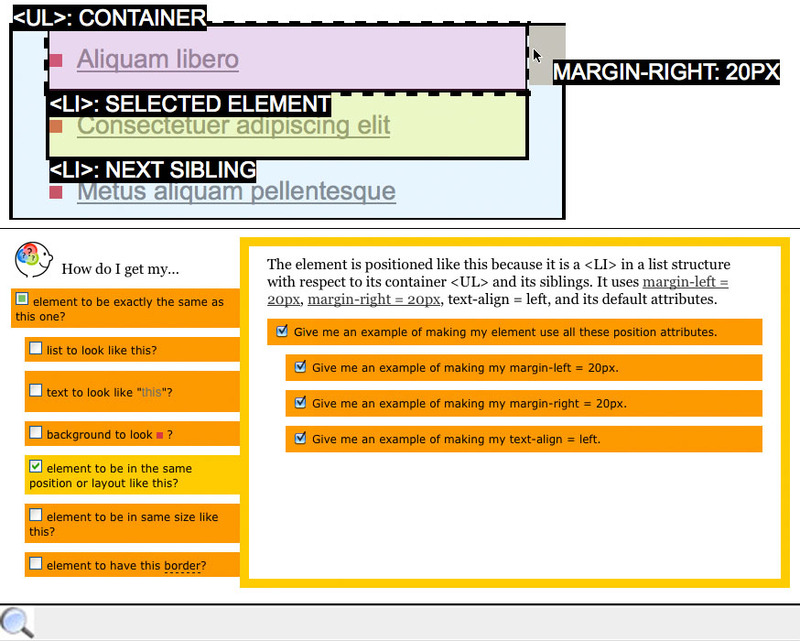 It also supports combining the styles and structures from multiple elements into the generated code, and provides visualizations on the web page itself to explain layout relationships. See our paper at CHI'12 or go to the project page. This study of mobile persuasion system explores the use of a mobile phone, when attached to an everyday object used by an everyday behavior, becomes a tool to sense and influence that behavior. Playful Bottle is a mobile persuasive system that makes use of a mobile phone attached to an everyday drinking mug and motivates office workers to drink healthy quantities of water. A camera and accelerometer sensors in the phone are used to detect the amount and regularity of water consumed by the user. Two hydration games are developed: a single-user TreeGame with automated computer reminders and a multi-user ForestGame with computer-mediated social reminders from members of the group playing the game. See our paper at UbiComp'09.